In 2010, Kroenke exercised his right of first refusal to buy the remaining interest in the St. Louis Rams from the estate of late owner Georgia Frontiere. On August 25, 2010, he became full owner of the Rams by unanimous consent of the NFL. To gain approval from NFL owners, Kroenke agreed to turn over control of the Denver Nuggets and Colorado Avalanche to his son, Josh, by the end of 2010, and he must give up his majority stake in both teams by December 2014. The NFL does not allow its owners to hold majority control of major league teams in other NFL markets. On January 5th 2015, it was announced that the Kroenke Group was teaming up with Stockbridge Capital Group to build an 80,000 seat NFL stadium and venue (dubbed the City of Champions Revitalization Initiative) in Inglewood, CA, a suburb of Los Angeles. St. Louis officials felt they were not getting fair treatment as Kroenke has (to date) had no talks or discussions with city officials, who have expressed large interest in keeping the team in St. Louis. 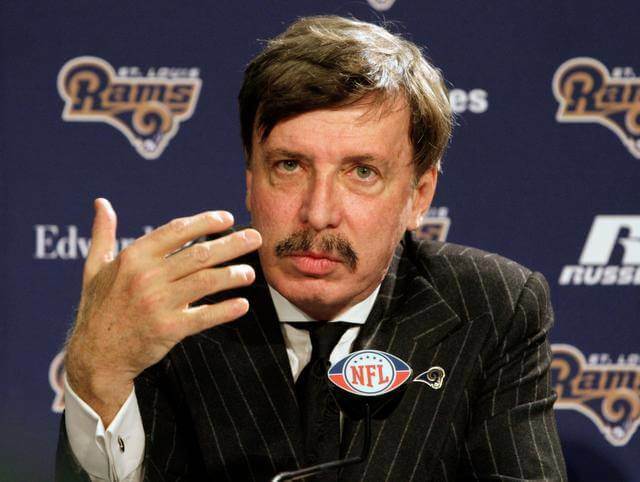 In a radio interview, Kroenke was labeled as “enemy number one” in his home state due to his uncanny nature and cut-throat business style expressed by his non-negotiations with St. Louis on the Rams stadium situation.